There are no rules. There are no boundaries. But at least there are roads – sort of. Traffic in Guinea-Bissau’s capital is like cramming thousands of New York City taxi drivers into a bombed-out, pot-holed Los Angeles mixed with huge masses of pedestrians, motorbikes, bicycles, street vendors and wheelbarrow-pushing men darting in and out of traffic. And don’t forget the hundreds of toka-tokas – rusted-out vans that carry up to 25 people at a time (several of them hanging on from the back door) that stop unpredictably in the middle of the road to unload their human cargo. Traffic in Bissau is chaos on steroids. But at least there are roads. It wasn’t always this way. When I was here in April and May, the Chinese government was busy reconstructing the main road in town (another massive project from Beijing in exchange for free reign of Guinea-Bissau’s natural resources). Getting around was a nightmare – traffic in both directions was squeezed into a couple unmarked lanes. There were no stop signs or stop lights. When I arrived here a couple weeks ago, I was pleasantly surprised to see a beautifully paved thoroughfare with three lanes each way. It even had crosswalks, signs, stoplights and a couple large roundabouts. I was told that when the stoplights first went up, women from the market sat on a bench on the side of the road and watched the lights turn colors. Cheap entertainment. Despite the improvements, Bissau traffic is chaotic as ever. The streets have changed, the drivers haven’t. But I’ve learned to adapt. Traffic madness aside, I’m glad I decided to visit the capital. There was a growing list of people who live in Bissau who I wanted to meet. The many day-trips I took from Bissau to Canchungo during my two months in Guinea-Bissau earlier this year were tiresome, stressful and not always as productive as I had hoped. So I set aside a couple weeks to hang out in Bissau this time. During my first week here, I spent a lot of time with Richard Kagel, a friend of mine from Santa Rosa, Calif., who owns an environmental quality-control lab and has recently become a huge advocate for Guinea-Bissau. He’s working with his longtime lab manager, a Guinean, to partner with a church in Bissau on a promising water-quality project: To build a plant in Guinea-Bissau that produces clay plots that can be used as water filters. (Find out more here: www.pottersforpeace.org). 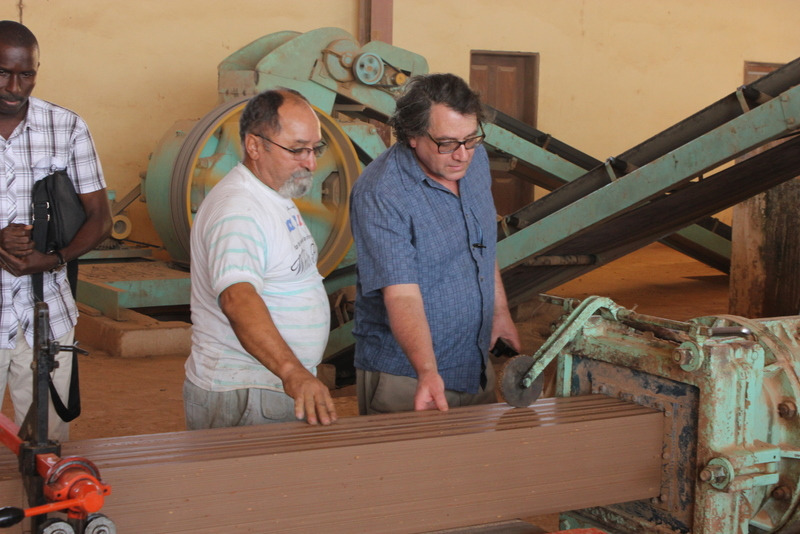 We spoke with several potential partners and also made a long trip to the eastern side of the country to visit a brick-making factory in a town called Bafata (pictured above). We also spoke with officials at UNICEF in Bissau about the project. Please be praying for Richard and the Bissau church for wisdom and clarity on how to proceed on this project from here. I’ve also had the chance to meet with a slew of dynamic and inspiring Guinean leaders: a pastor who leads a highly successful vocational school in Bissau that partners with Youth For Christ; another pastor who is studying law and is determined to help the church find self-sustaining ways of doing ministry and development work; a woman who used to lead the country’s equivalent of the FBI and Drug Enforcement Administration but was pressured by the military to leave after she started interfering with the country’s rampant drug-trafficking underworld; a former official for West Africa’s central bank who has his fingers in several development projects in Guinea-Bissau; and a United Nations official who grew up in the states but is back here helping his country. I’ve also met with some equally interesting non-Guineans: a former U.S. ambassador to Guinea-Bissau who has spent the last 11 years de-mining Guinea-Bissau from three wars; an Italian who gave up a PhD in economics so that he could help a Catholic vocational school in Bissau develop; a Portuguese who got tired of working from a cubicle for a development agency and moved to Canchungo to work with a French NGO; and a young American couple working at the Youth For Christ school in Bissau that has been a key asset to the school and a big reason for its success. I also had the chance to meet with several officials at UNICEF who expressed interest in the work that WAVS is doing in Guinea-Bissau. And I made a couple trips to the small U.S. Consulate in Bissau to talk about partnering with the U.S. State Department. Please continue to pray for more partnership opportunities to open up. I’ll return to Canchungo on Wednesday, thankful for a whirlwind, yet productive, two weeks in the capital. On Saturday, the Guinean WAVS school board will meet to interview three candidates for the school director position. Thankfully, we have three highly-qualified candidates for the job (two have masters degrees and the third is finishing an undergraduate degree in pedagogy). Any of them would do a good job, but please pray for wisdom as we decide which one is the best fit for the school.